Free Space Optical Communications (FSO, Infrared, Optical Wireless, Laser) is now established as a viable approach for addressing the emerging broadband access market and its “last mile” bottleneck.. These robust systems, which establish communication links by transmitting laser beams directly through the atmosphere, have matured to the point that mass-produced models are now available. Optical wireless systems offer many features, principal among them being low start-up and operational costs, rapid deployment, and high fibre-like bandwidths. These systems are compatible with a wide range of applications and markets, and they are sufficiently flexible as to be easily implemented using a variety of different architectures. Because of these features, market projections indicate healthy growth for optical wireless sales. Although simple to deploy, optical wireless transceivers are sophisticated devices. The many sub-systems require a multi-faceted approach to system engineering that balances the variables to produce the optimum mix. A working knowledge of the issues faced by an optical wireless system engineer provides a foundation for understanding the differences between the various systems available. This paper aims to examine the many elements considered by the system engineer when designing a product so that the buyer can ask those same questions about the systems they are evaluating for purchase. Currently available Free Space Optics (FSO) hardware can be classified into two categories depending on the operating wavelength – systems that operate near 800 nm and those that operate near 1550 nm. Each vendor manages to make huge claims that their own chosen wavelength is “best”. But as we point out below, it’s actually “real world link margin”, not “market-eering” that matters. Contrary to claims, there are only a few compelling reasons for selecting 1550 nm Free Space Optics (FSO) systems, and many against. 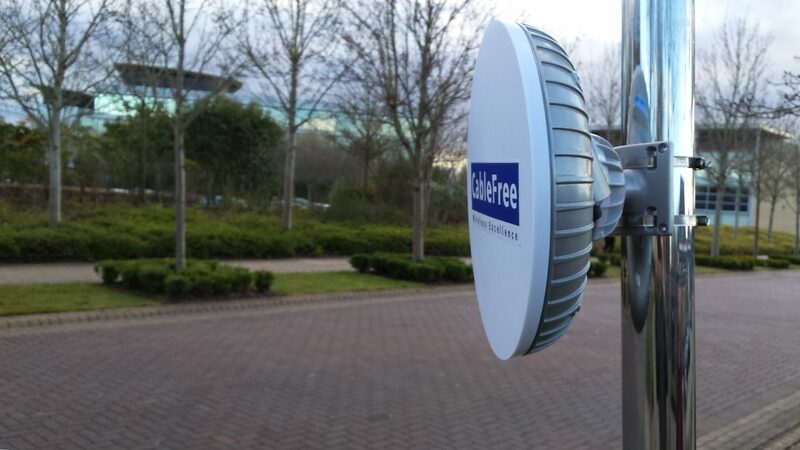 One argument in favour is about laser eye safety, but ignores the effect of increased transmit aperture used by a competing 980nm solution from a vendor such as CableFree. There is reduced solar background radiation at 1550nm, but the receiver devices are much less sensitive than the enhanced silicon at 800-980nm, completely negating any advantage. A spurious argument is “compatibility with existing technology infrastructure” – well, as the signal is always regenerated before going into the network, with an O-E-O conversion, that argument is a complete dead duck. The wavelength choice alone is misleading. FSO is all about usable “real-world” link margin. A properly-designed 980nm system is proven to be far better than a supposed “carrier class” 1550nm system that suffers reduced output power and insensitive receivers. The true argument for 1550nm is about the existence of EDFAs, optical amplifiers which can boost transmit signals to whole watts of power, and the existence of DWDM components which enable multi-channel multi-gigabit systems for the future. But the cost penalty associated with 1550nm makes it inappropriate for a “today” customer needing E1/T1 -> Gigabit under 4km. Laser beams with wavelengths in the range of 400 to 1400 nm emit light that passes through the cornea and lens and is focused onto a tiny spot on the retina while wavelengths above 1400 nm are absorbed by the cornea and lens, and do not focus onto the retina, as illustrated in Figure 1. It is possible to design eye-safe laser transmitters at both the 800 nm and 1550 nm wavelengths but the allowable safe laser power is about fifty times higher at 1550 nm. However, this argument ignores the effect of aperture. A small-aperture 1550nm system is actually less safe than a large aperture 980nm system, a fact that 1550nm proponents neatly ignore. Carrier-class Free Space Optics (FSO) systems must be designed to accommodate heavy atmospheric attenuation, particularly by fog. Although longer wavelengths are favored in haze and light fog, under conditions of very low visibility this long-wavelength advantage does not apply. The argument is about usable link margin, NOT wavelength. There are a number of factors to consider when examining the effectiveness of the receiver in an FSO system; these include the type of detector used, the sensitivity rating and size of the detector, the size and design of the receiver optics, and the operating wavelength itself. In order to correctly assess the efficiency of the overall system, one must also take into account the number and power of the lasers being used to generate the signal. Types of optical detectors used in FSO equipment come in two basic types: PIN and APD. The PIN detector is a lower cost detector that has no internal gain, while the APD is a more expensive but also more sensitive detector with internal gain. The Benefits of using APD over PIN technology will vary, but real-world results indicate the benefits to be an improvement in sensitivity of approximately 4x that of a PIN detector. The argument comes back again to “usable real-world link margin”. If the vendor has used a cheap detector, it has to be made up somewhere else. A factor of 4, or 6dB, means 4x the transmit power, or half the distance. The size of the receiver optics is also important; a larger area receive optic contributes to reducing errors due to scintillation. Scintillation is atmospheric turbulence due to solar loading and natural convection, causing temporally and spatially varying refractive index changes in the air. As a laser beam propagates through the atmosphere, there is a time-varying intensity at the receiver due to this phenomenon; this is referred to as ‘scintillation’. This is quite similar to the apparent twinkling of the stars or distant city lights, which is due to the same effect. The result is that an FSO communications receiver can experience error bursts due to surges and fades in the receive signal strength. One way to combat this scintillation effect, and thus improve the error-rate performance, is to use a large aperture receiver. A collecting aperture that is much larger than the spatial scale of the scintillation provides an averaging effect of the localized surges and fades, thus improving the error rate. This large-aperture approach is more effective for scintillation reduction than multiple smaller apertures, which perform less averaging at each lens. Another way to mitigate the effects of scintillation is to use multiple transmitters, each of which takes a slightly different path through the atmosphere, which also contributes an averaging effect. The net result is that a properly designed system can defeat scintillation impairments. The operating wavelength of an FSO system also contributes to the performance of the receiver. It is generally true that high-quality photodiodes at both 800nm and 1550nm achieve comparable quantum efficiencies. However, the sensitivity of a 1550nm receiver is generally lower due to noise floor. Again, it all comes down to “usable real-world link margin”. 1550 nm wavelength range is actually NOT the most commonly specified for terrestrial fiber-based optical communications – most LAN ports using fibre, and new automotive fibre systems all use 850nm, which is cheaper. Ignoring such bogus arguments, and thinking about pace of technology developments, most of it is in terms of reducing cost and increasing reach and bandwidth. In fibre systems, 1550nm is used for long haul, as dispersion is lower (not true for FSO though – there is no advantage) 850nm devices are used for shorter fibre links, and are much cheaper. High transmitted power may be achieved by using erbium doped fibre amplifiers, or by non-coherently combining multiple lower cost semiconductor lasers. Narrow transmitting beamwidth (a.k.a. high antenna gain) can be achieved on a limited basis for fixed-pointed units, with the minimum beamwidth large enough to accommodate building sway and wind loading. Much narrower beams can be achieved with an actively pointed system, which includes an angle tracker and fast steering mirror (or gimbal). Ideally the angle tracker operates on the communication beam, so no separate tracking beacon is required. Larger receiving optics captures a larger fraction of the total transmitted power, up to terminal cost, volume and weight limitations. And high receiver sensitivity can be achieved by using small, low-capacitance photodetectors, circuitry which compensates for detector capacitance, or using detectors with internal gain mechanisms, such as APDs. APD receivers can provide 5-10 dB improvement over PIN detectors, albeit with increased parts cost and a more complex high voltage bias circuit. These four parameters allow links to travel over longer distance, penetrate lower visibility fog, or both. In addition, Free Space Optics (FSO) receivers must be designed to be tolerant to scintillation, i.e. have rapid response to changing signal levels and high dynamic range in the front end, so that the fluctuations can be removed in the later stage limiting amplifier or AGC. Poorly designed Free Space Optics (FSO) receivers may have a constant background error rate due to scintillation, rather than perfect zero error performance. FSO Fixed-Pointing or Active Tracking/Pointing? Another element of Free Space Optics (FSO) system design that must be considered by a prudent buyer is the challenge of maintaining sufficiently accurate pointing stability. A number of Free Space Optics (FSO) systems employ an active pointing-stabilization approach, which represents an effective approach for addressing this challenge. However, the cost, complexity, and reliability issues associated with active-pointing approach can be avoided in some applications (particularly for shorter ranges and lower data rates) by utilizing the fixed-pointed approach schematically shown in the figure. According to this approach, the transmitted beam is broadened significantly beyond its near-perfect minimum beam divergence angle, and the receiver field of view is broadened to a comparable extent. The broadening of the transmitted beam and receiver field of view leads to large pointing/alignment tolerances and a very low probability of building motion being of sufficient magnitude to take the link down. Well engineered hardware exploits this approach of designing for loose alignment tolerances. Therefore, it is possible to perform initial alignment of the transceivers at opposite ends of the link during installation and then leave them unattended for many years of reliable service. Practical experience shows that systems with beamwidths less than 5 milli-radians are unreliable without tracking, as buildings move more than that; systems above 5mrad are reliable without tracking. For carriers today the issue of interoperability of systems within their multi-faceted networks made up of both legacy and next generation networks is crucial. Most Free Space Optics (FSO) systems currently available are physical layer devices that act the same way as fiber optic cables and receivers and are therefore able to work with all protocols while not being limited to any of them. Most designers of Free Space Optics (FSO) systems have opted for a protocol ‘transparent’ approach for both deployment flexibility and cost-reduction. Should a customer wish to add such switching functionality to networks incorporating physical layer products there are many switches available on the market, all of which will interoperate with a physical layer device. Every customer wants to know the expected failure rate of the equipment they are investing in, for outdoor or industrial applications the ruggedness of a system becomes even more important. A system can be engineered and designed for exceptional reliability. Engineering a product for long-life includes selecting top-quality, long-life components from reliable vendors. Telecom grade components are preferred, as are low-stress electronics. The system must also be designed to maintain an optimum operating environment for the selected components and sub-systems. A rugged, environmentally-sealed housing is the first defence of a system against the elements. Appropriate heating and cooling mechanisms should be also in place in order to maintain optimum temperature and humidity within the device. In addition, a system design that incorporates a mechanism for reducing laser power during clear weather will extend the life of the laser drivers and the product itself. Active cooling of each laser will further enhance the lifespan of these relatively expensive sub-systems. If these considerations are taken into account, the system should have an impressive MTBF (mean time before failure). High transmitted power may be achieved by using erbium doped fibre amplifiers (EDFA), or by non-coherently combining multiple lower cost semiconductor lasers. Narrow transmitting beamwidth (a.k.a. high antenna gain) can be achieved on a limited basis for fixed-pointed units, with the minimum beamwidth large enough to accommodate building sway and wind loading. Much narrower beams can be achieved with an actively pointed system, which includes an angle tracker and fast steering mirror (or gimbal). Ideally the angle tracker operates on the communication beam, so no separate tracking beacon is required. Larger receiving optics captures a larger fraction of the total transmitted power, up to terminal cost, volume and weight limitations. And high receiver sensitivity can be achieved by using small, low-capacitance photodetectors, circuitry which compensates for detector capacitance, or using detectors with internal gain mechanisms, such as APDs. APD receivers can provide 5-10 dB improvement over PIN detectors, albeit with increased parts cost and a more complex high voltage bias circuit. These four parameters allow links to travel over longer distance, penetrate lower visibility fog, or both. All necessary certifications for Laser Safety (CFR, ANSI, IEC), Electrical Safety (CSA, UL, EN) and Electromagnetic Compatibility (EMC) must be met. However, many additional tests may be performed to ensure excellent performance in all conditions. Laser eye safety is classified by the International Electrotechnical Commission (IEC), which is the international standards body for all fields of electrotechnology. While the IEC is an advisory agency, its guidelines are adopted by the regulatory agencies in most of the world’s countries. A laser transmitter which is safe when viewed by the eye is designated IEC Class 1M. Extensive testing should be performed to properly qualify the system for highly reliable performance in all outdoor environments. Testing can include, rain tests wind-driven rain tests, pressure tests, dew point checks, vibration tests, wind tests both for survivability and pointing stability in high-winds and underwater immersion tests to ensure seal integrity against water leakage. The testing can also include humidity tests and salt-corrosion tests to ensure the unit is suitable for marine environments. All tests, when possible, should be conducted with the units in operation so that functionality can be measured throughout the test rather than simply assuring the survivability of the unit. In addition to the environmental tests, accelerated life tests can be conducted to ensure a long operating life. In addition, critical sub-systems can be tested separately in even more extreme temperatures. In addition, testing should be done to certify the system to various international electromagnetic standards for products. These tests include radiated emissions, conducted emissions, and also radiated susceptibility and conducted susceptibility. The emissions tests are required to ensure the Free Space Optics (FSO) terminal and its power supply will not interfere with other systems. The susceptibility tests go one step further, and help ensure that the Free Space Optics (FSO) equipment will not be affected by adverse electromagnetic environments from nearby equipment, such as rooftop air conditioning systems, microwave and cellular transmitters, etc. As well, tests for harmonic current emissions, and immunity to intense magnetic fields, voltage fluctuations and interruptions, electrostatic discharge, and lightning surge impulses can also be included. The final proof of the viability of any broadband access approach, including optical wireless, is the successful conclusion of rigorous field-tests. Ideally, such field tests should include operation 24 hours per day, 7 days per week. The most convincing tests are those in which weather conditions vary widely during the tests, and include periods of steady drizzle, heavy driving rain, snow, and various degrees of fog. Another way to assess the field-worthiness of Free Space Optics (FSO) hardware is to consult an independent assessment of the performance. These objective assessors will test a device in a number of ways. Some are focused on performance and ease of use, they will try to install a unit direct from the box, evaluating manuals and procedures along the way. They can also attempt to impede transmission with various ‘obstacles’ through which the communications must pass. As well, tests that rate the reliability of a device in MTBF (mean time before failure) can be performed. Some of the most stringent standards in the industry are maintained by Telcordia/Bellcore to establish guidelines for carrier-class products. In general independent tests validate manufacturer’s claims of reliability and performance. Free Space Optics (FSO) installation hardware should be designed both for ease of setup and alignment, as well as providing a stable, rugged mount which maintains alignment under environmentally stressing conditions and aging. For example, a yoke assembly mounts on a vertical pole, and allows the optical head to be easily dropped into place. Coarse angular adjustment can be provided using rifle sighting scopes. The signal can then be maximized by viewing on a personal computer display (or voltmeter), and adjusting push-pull screws, which offer both fine alignment and lock-down capability. The unit should be designed to maintain its initial alignment over its operational life – for fixed-pointed systems the beam should be broad enough to withstand building motion on tall skyscrapers and to operate in high-winds; for active-pointed systems the system should be sensitive enough to respond to sudden events such as high-winds or earthquakes. For modern carrier networks, a network management and monitoring capability with an easy-to-use graphical interface is essential. Many Free Space Optics (FSO) products are physical layer devices, i.e. completely analogous to fiber optic cables and transceivers, so the network interface that monitors the active devices is easily provided over a separate CAT5 cable or RS-232 port, and is preferably IP-addressable. Some carriers prefer the network interface to be combined with the optical data stream, either with a separate channel, or using inter-element data bits in a SONET data stream. Sending SNMP over a SONET data communication channel requires additional Layer 3 equipment, either built into the Free Space Optics (FSO) terminal, or in the equipment room. However it is provided, the SNMP interface should allow the monitoring of the status of active components health with enough fidelity to predict problems before they become a system outage. The Free Space Optics (FSO) market segments along three primary characteristics: cost, data rate, and link length. Because of the cost sensitivity, it is imprudent to attempt to design one product to cover the entire market space, since that will generate a high-priced product that is more expensive than a customer can justify for the large fraction of the Free Space Optics (FSO) market that comprises the less-challenging applications. In order to provide the customer with the greatest value, then, it is essential to offer a product mix that recognizes “one size does NOT fit all.” Each of several key application areas demands a complementary set of features that just meets the demands of that application area without adding additional costs associated with non-essential performance features. For carriers, volume manufacturing is a key requirement, as mainstream deployment in a worldwide carrier network includes thousands of network elements. A high volume production facility for Free Space Optics (FSO) should ideally be designed specifically to produce Free Space Optics (FSO) products, as Free Space Optics (FSO) is unique from any other fixed wireless or fiber optic products. Layout and process flow should be optimized for product families, for example fixed-pointed and actively-pointed products may be better suited toward separate production lines. Procurement processes should be compatible with just-in-time parts delivery, which requires coordination and good working relationships with all major suppliers. The capability to operate on double (or even triple) shifts provides maximum return on fixed assets, as well as flexibility to adjust to changing market conditions. While cost is always a consideration when procuring telecom products, many buyers are interested in obtaining the best value proposition in the medium to low cost range. For example, higher performance, with little extra cost penalty, often provides the best value. The key factors that affect cost are system design (i.e. choice of components and their configuration), minimization of manual labor (especially for optical alignment), and volume manufacturing to reduce procurement costs and amortize non-recurring costs. When this philosophy is consistently applied to product design, the overall result can be very high incremental performance with low incremental cost. For many prospective buyers an appropriate reference builds the most confidence in a company and their products. Many manufacturers offer case studies, demo sites or reference customers that can be contacted. Some Free Space Optics (FSO) companies have a worldwide installed base in the hundreds of units. Case studies that represent carrier-class, mission-critical links will be of most value to carriers wishing to deploy the system. A solid field-testing program can determine how well the devices will function in real-world deployments. See FSO @ Work around the globe ». The potential for Free-space optical networking to solve communications bottlenecks is making it a popular option for reliable, broadband access. A thorough examination of the issues affecting the design of these sophisticated systems is a useful tool when evaluating Free Space Optics (FSO) systems for purchase. Systems that incorporate the most beneficial features, are well-engineered, and thoroughly tested will be top performers and provide the best value.